cultivates allotment, usually rented from local authority, and sells produce; as for market gardener; usually spare time, and rarely principal occupation. a market gardener (q.v.) who specialises in growing asparagus for market. constructs, levels, drains and lays out bowling greens with special turf, usually received from Cumberland. cultivates bulbous plants, e.g., tulips, daffodils, lilies, and increases the number of bulbs by means of off-set bulbs and from seed obtained from the flowers; sells all blooms and surplus bulbs. a market gardener (q.v.) who specialises in intensive cultivation of plants out of season, e.g., beans, peas, generally under glass; frequently employs French system of garden cultivation, i.e., glass cloches or bells. does skilled work on fruit farm, including grafting, planting, pruning, spraying. cultivates flowers in nursery garden or flower farm in open ground or under glass; sends cut blooms and flowering plants to market, or sells them direct to private customer; as for gardener; cf. florist (770). a casual worker who picks or cuts by hand, flowers from flower beds at nursery or flower farm; sometimes also carries the flowers to packing sheds and packs them into boxes ready for despatch. (ii) ties up picked flowers in bunches (dozens or half-dozens) ready for packing and despatch to market. grows fruit. e.g. melons, peaches, strawberries, grapes, in glass houses for market; usually combines fruit growing with cultivation of cucumbers, tomatoes, etc. general term for cultivator of flowers, fruit and vegetables; main duties consist in digging and manuring soil, planting seeds, bulbs and young plants, watering plants during dry season, weeding ground, tying up plants to stakes, removing dead plants, pruning and spraying fruit trees, picking fruit, etc., for the house, mowing lawns and attending to paths; frequently also has charge of glasshouses and frames; where work is sub-divided is sometimes specifically designated, e.g., cemetery gardener, day gardener, domestic gardener (wholetime or resident at private house), jobbing gardener (paid by the day or job), kitchen gardener (q.v.) (growing vegetables and soft fruit), orchard gardener. a gardener (q.v.) who specialises in raising tropical and subtropical plants in hot house, or in favourable open air situations. submits plans for laying out or alteration of garden; drains, lays out according to design and plants gardens by contract, see gardener; builds pergolas, rockeries, ornamental ponds; lays down turf and constructs paths. a small farmer (011) (q.v.) who cultivates vegetables, flowers and fruit for market; determines rotation of crops with a view to planting against the markets; supervises loading of vans or lorries; attends at markets for sale of produce when neither salesman nor commission agent is employed. (ii) grafts cultivated rose cuttings on briars. has care and general supervision of cultivation of fruit trees on farm; superintends digging, manuring, planting, grafting, pruning, picking, etc. a gardener (q.v.) who specialises in the cultivation for sale of herbaceous plants containing properties for medicinal or culinary purposes. 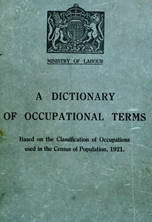 general term for any person engaged or skilled in horticulture, either in theory or practice. drives motor used in mowing lawns, cricket grounds, etc. ; sets, adjusts, and sharpens blades of cutters; adjusts or tunes engine and generally keeps machine clean and in good running order. a market gardener (q.v.) who specialises in growing mushrooms from spawn for market; prepares mushroom beds in specially constructed dark cultivating sheds and inserts spawn. prepares and sells mushroom 'bricks' for propagation; may also grow mushrooms. a gardener (q.v.) who grows, either under glass or outside, flowers, shrubs, young trees, etc., for purposes of decoration or for stocking gardenia. an exotic gardener (q.v.) who specialises in growing orchids for sale. builds rockeries or stonework for rock gardens under direction of landscape gardener (q.v. ); plants rock plants. a gardener (q.v.) employed in propagating house of nursery, raising plants from seeds and cuttings : keeps temperature of house at moist heat in order to maintain a "growing" atmosphere. (ii) in public parks, prunes, i.e., cuts back or thins any kind of tree with knife and saw. a rhubarb raiser (q.v.) who grows rhubarb for early market either in hot houses or outside protected by straw and wooden boxes or barrels. a market gardener (q.v.) who specialises in raising rhubarb for market. cultivates bush, standard or rambler roses from cuttings or by grafting on briars, see grafter; manures ground, prunes, stakes and labels trees; contracts to lay out rose gardens; despatches rose trees or blooms to customers or market. cultivates seeds sent to him by the seedsman, in bulk; allows plants to run to seed and extracts seeds by threshing; after further seeds have been produced, despatches them to the seedsman (770) (q.v.) for sale to the public. assists seed grower (q.v.) by cutting down or picking plants after they have been allowed to run to seed and separates the seed from the plant by threshing; feeds plants into small power- driven threshing machine or lays plants on a cloth and beats them by hand with a stick; removes plants and rubbish by hand and finally passes seed through a sieve. a gardener (q.v.) who keeps in order gardens occupying centre of residential squares' in towns; cuts grass, tends paths and keeps flower beds supplied with plants; usually also raises plants. a market gardener (q v.) who grows tomatoes for market, usually under glass.